Since I can’t quite keep up with cooking all of the wonderful fresh English produce available right now, I decided to turn my hand to pickling, and…oh em gee was it not only super easy, but also way more tasty than any shop bought pickles I’ve ever had. Using only 2 base ingredients for the liquid (apple cider vinegar and maple syrup), these pickled radishes, onions and cucumbers had a real proper party in my mouth 🎉 I’ve since had to give myself a strict 11am ‘pickle happy hour’ because I felt there was something not quite right about delving into them at 8am with my porridge like I did on Day 1! This base recipe is so versatile, so feel free to chuck in any vegetable you fancy! Plus, there are a whole host of wonderful flavour combinations possible — I think next time I will try my hand at some spicy chipotle chilli red cabbage so stay tuned! Optional flavour additions — Black Peppercorns, Garlic Cloves, Chipotle Chilli Flakes and Fresh Herbs. · In a saucepan, heat the apple cider vinegar, water and maple syrup over a medium heat. · Bring to the boil and simmer on a low heat for 5 minutes. · Thinly slice the vegetables (using a mandolin if you don’t have the great ‘I’m-gonna-lose-a-finger’ fear). · Sterilize an airtight glass jar — see note below on how. · Place the seeds in the bottom of the jar and add the veggies on top. · Pour in the liquid and seal the jar. · Once cooled, place in the fridge. 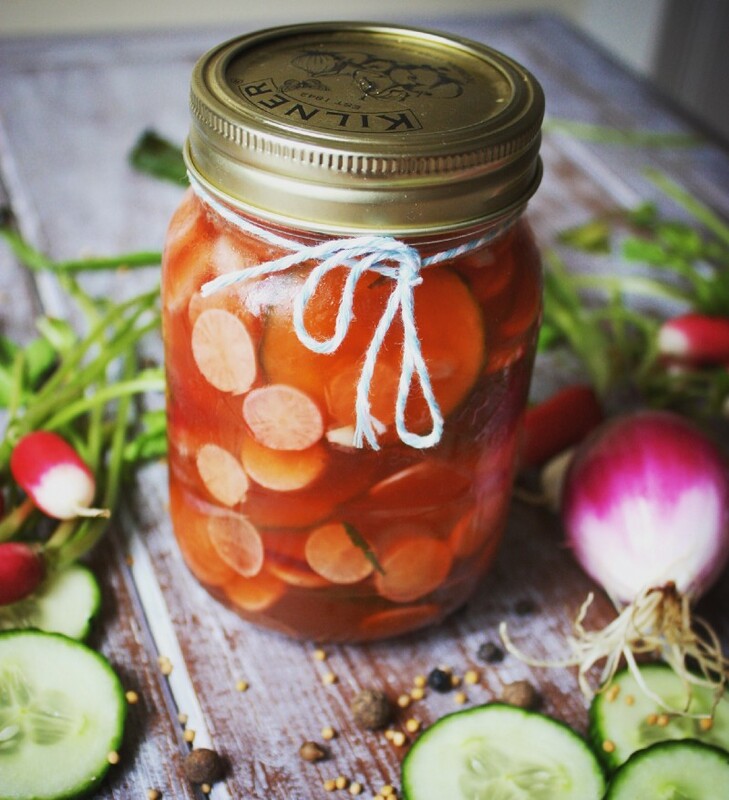 · The pickles will be ready to eat after a few hours, but will keep well in the fridge for several weeks. How to sterilize a glass jar — Preheat the oven to 140 degrees C (fan oven). Wash the jars in hot, soapy water and rinse well. Place the jars on a baking sheet and put them in the oven to dry completely. But if you use Kilner jars, boil the rubber seals instead, as dry heat damages them.